Hello, my dear readers! Happy Wednesday! Work is about to get hectic as balls for the next couple of weeks leading up to Christmas. I'm going to do my best to make sure my nails stay in good condition, dressed for the season, and photographed for you! I used mostly OPI polishes for this look: the gradient is with Don't Touch My Tutu! (soft sheer white), Happy Anniversary! (pearl white), and then the tips are Wet 'N Wild Going Platinum (silver foil with sparse gold flecks). On top of the gradient, I went back to OPI for Pirouette My Whistle, one of my favourite glitters ever. 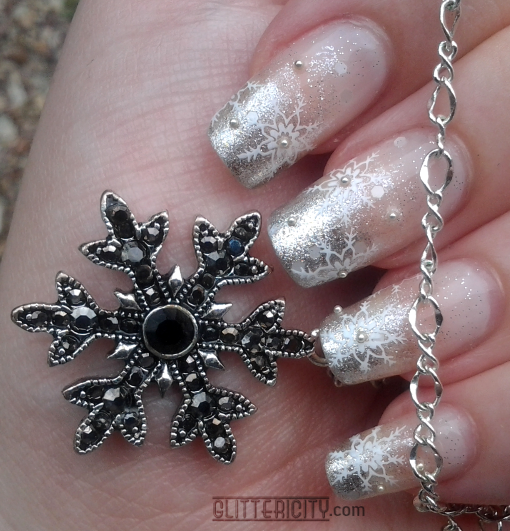 The soft silver microglitters and translucent white hexes are perfect for this snowy look! I used Konad white stamping polish & their plate m59 to stamp the snowflakes, then added a few silver microbeads from dollarnailart.com. And finally, two coats of Seche Vite to keep it all shiny and in place. I love how shiny the silver tips are. Will you have a white Christmas? I certainly won't, but I find it amusing (and gorgeous) that Australians still decorate with snowflakes and wintery scenes for the season. I guess it's just become so symbolic of the holiday--and well, it is pretty! Those are amazing!!!!!! I love snowflakes!